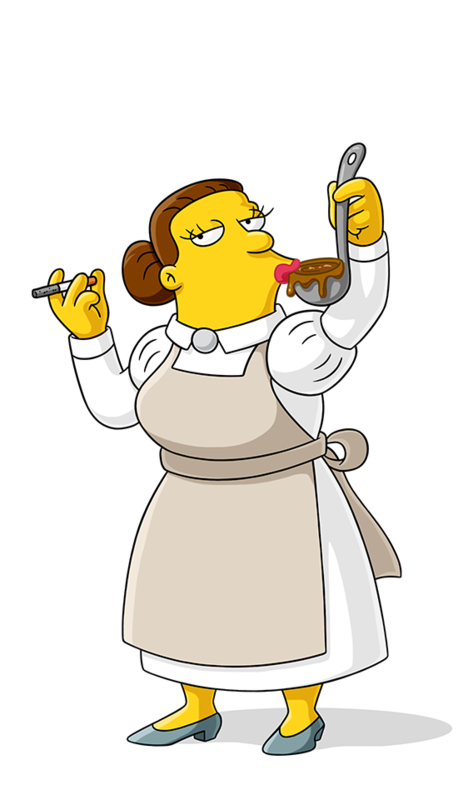 Head dietician at Springfield Elementary. She has devoted her life to food preparation. Chain smokes while cooking. Indifferent to any foreign elements, rodents, etc., that may accidentally fall into school dinner. Says, "The staff are complaining about rats in the kitchen -- I want a new staff." The Springfield Elementary teachers send kids to detention and use them as food to feed the other kids. Pincipal Skinner wants to eat Bart's shorts and has the students locked up in cages. Okay, I got your German grub right here. Nothing brings 'em around like old cafeteria meatballs.